Nativity scene from Ug anda, made of banana leaf and other materials. issue of NEWSpirit Digest is our last for 2016. We hope you have benefited from our reporting of local church, conference and denominational news throughout this eventful year. We look forward to offering you more of the same in 2017. May God bless you with the light of Christ's love, joy and peace now and in the coming year. the Rev. Dr. Martin Luther King Jr., in leading us like a "drum major" in the difficult march toward social justice. Those three appeals signify ministry priorities she will promote throughout the Philadelphia Area next year: personal and collective devotion to prayer, generous stewardship of God's gifts to enhance ministry, and the pursuit of social justice for all. Watch and share this video message on our YouTube channel. So your church is already for Christmas Eve and Christmas Day, right? The celebrative greens are hung, the choirs and pageant performers are rehearsed, that final Advent/Christmas candle awaits illumination, the chancel and Christmon tree are properly decorated, the special menu is set. That's everything, right? What about the greeting and welcoming of visitors? No, not the half-smiling, momentary "Hello" and brief handshake some members typically offer to strangers before they turn to greet more familiar faces with a hug and "How are you"? What about a real, eye-to-eye, "Glad to see you," "What's your name?" and "Where you from?" greeting? One that also might add, "Do you need anything?" or "Want to join us for coffee later?" or "You should come back to worship with us on New Year's Day." This week UM Communications' website offers some helpful articles about inviting and welcoming visitors more effectively, especially at Christmas time. There's even one article about preaching to reach people in the new year. And another on relational marketing that gets beyond the gimmicks many churches use. Take a look and unwrap some of these wisdom gifts to help your church offer the love of Christ in truly welcoming ways. And if you do have special ways to welcome visitors, please share them with us so we can share them with others. A handful of spirited church members joined a young street-marketing team on the shivering sidewalks of Philadelphia's Center City last weekend to offer hot cocoa and a warm Christmas welcome to passers-by. Their friendly, outgoing presence embodied United Methodist Communications' "Rethink Church" advertising slogan, "Church can happen anywhere." How to help the people of Aleppo: The United Methodist Committee on Relief (UMCOR) is actively responding to the many desperate migrants fleeing war-torn regions such as devastated Aleppo in Syria. To support UMCOR in this cause, please donate to UMCOR's Global Refugee/Migration Advance #3022144. Donate here. Please also consider donating your time and resources to creating relief supply kits for those in need, especially health and school kits. Visit UMCORâ€™s website to see more information and a video about the global plight of refugees. "A New Father, Awe-struck" is a timely, new hymn by Carolyn Winfrey Gillette, who has published over 300 hymns sung by congregations around the world. This Christmastide hymn begins with a traditional manger scene but then portrays the Holy Family that became poor, powerless refugees escaping certain death. It is a prayer for the church to work for justice and mercy as our gift to Jesus. Permission is given for free use of this hymn by churches that support refugee relief efforts. This hymn would be appropriate for use on Christmas Eve, Christmas Sunday and New Year's Day. (The First Sunday after Christmas' lectionary Gospel reading tells of Jesus and his family being refugees fleeing Herod). Bishop Rosemarie Wenner of the Germany Episcopal Area issued a statement following the attack at a Christmas market in Berlin that left 12 people dead and injured at least 48 more. "Right in the face of the manifestations of horror -- whether because of terror in Berlin and elsewhere or because of war and war crimes in Syria and other neglected places -- we set our hope in Jesus Christ," she writes. "I pray for God's comfort for the victims of the attack in Berlin and for their families. Methodists from all over the world have let us know that they are praying for those immediately affected and for our country. "Thanks to all of you who shared God's love with inmates through a signed Christmas card this year," writes Marilyn Schneider, leader of the conference Prison & Restorative Justice Ministries Team. "To those who are incarcerated, this is a powerful message of caring. At a time when many feel very much alone, it is a reminder that they are a beloved child of God. May this ministry continue to grow and touch hearts behind prison walls." Wharton-Wesley UMC in Philadelphia hosted a "College Prep 101" workshop Dec. 3 to share valuable information with individuals and families about paying for, getting in and getting through college. Sponsored by the Eastern PA Conference Scholarship Committee and the Southeast District Office, the workshop was facilitated by Lenora Thompson, who chairs the Conference Scholarship Committee, and the Rev. David W. Brown, Deacon, who teaches at Temple University and serves as Vice-Coordinator of Black Methodists for Church Renewal (BMCR). Both provided a wealth of resources, information and personal insights about the college preparation process, including choosing a college, preparing for aptitude tests, and finding and applying for financial aid. More than 50 Lehigh Valley leaders of Christian, Jewish, Muslim, Buddhist, Hindu, and Unitarian faiths signed a formal statement of solidarity Dec. 12 announcing their intention to stand against any acts of bigotry targeting race, nationality, religion, gender, or sexual orientation. The group held a press conference at the Respect Graduate School in Bethlehem, an institution dedicated to Islamic studies. The Lehigh Conference of Churches (LCC) in Allentown hosted the signing, a response to recent incidents of bigotry and bullying in Lehigh Valley schools and communities. Such incidents "show that the climate of division in our country surrounding issues of race and religion is hitting home," read the media advisory. "With residents looking for guidance, the Lehigh Conference of Churches is bringing together leaders from Christian congregations and interfaith partners to take a stand against such acts and encourage civil discourse and dialogue....With a unified voice, faith communities are offering themselves as resources for conflict resolution, restorative justice, and community building." "The Muslim community is one of the most vulnerable communities," said the Rev. Larry Pickens, Ecumenical Director of the LCC and pastor of Emmanuel UMC in Allentown. "As people of faith, whenever a group is vulnerable, it is important that we stand with them and rally around them." The Rev. Irving Cotto, Northeast District Superintendent, joined Pickens in signing the statement. Read the full statement. Members of the UMC's Oklahoma Indian Missionary Conference (OIMC) braved subfreezing temperatures last week to deliver 700 Christmas stockings to water protectors still camped near the Standing Rock Sioux reservation in North Dakota. The U.S. Army Corps of Engineers blocked construction of a crude oil pipeline under a dammed section of the Missouri River, temporarily halting the Dakota Access Pipeline. But many members of the Standing Rock Sioux tribe and other protesters have chosen to stay at the camp to make sure construction does not continue. Read Ginny Underwood's account of the OIMC's Christmas visit. Also, look for an update on our website Friday, Dec. 23, to learn of other happenings at the protest site, including United Methodist involvement, and to read comments from several members of our conference's Committee on Native American Ministries. Two compilations of John Wesley's sermons translated into Spanish have been published by the United Methodist Board of Higher Education and Ministry. UM Discipleship Ministries is increasing the diversity of its top leadership with the addition of two new executives. The Rev. Bener Baysa Agtarap, superintendent for congregational vitality in the California-Nevada Conference, is the new Associate General Secretary in charge of New Church Starts, also known as Path 1. He began his career has a young pastor starting new churches in the Philippines. Read press release. 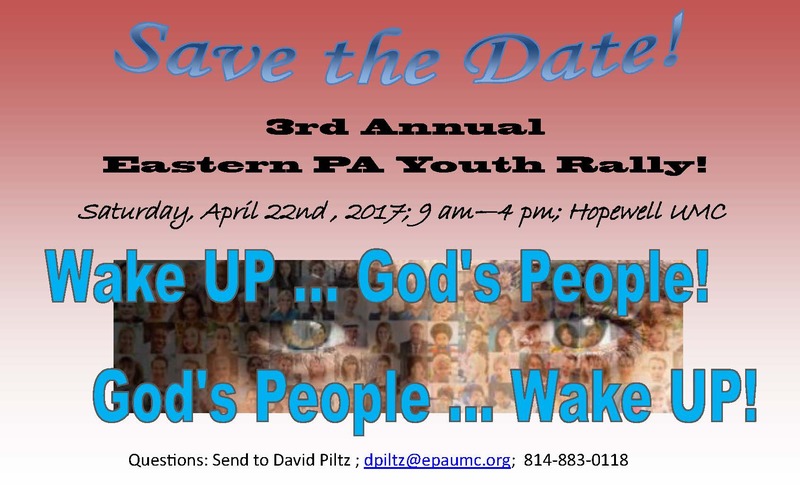 The annual Peninsula-Delaware Conference Youth Rally will return to the Ocean City (Md.) Convention Center January 6-8 (from Friday evening to Sunday morning). Thewinter weekendrally and retreat will offer praise and worship, learning and laughter through games, fellowship and plenty of fun. On Tuesday, Feb. 28, the day before Ash Wednesday, clergy across the conference will gather at locations in their respective districts for a Clergy Lenten Day Apart. They will pray, worship and fellowship together in preparation for the beginning of the Holy season of Lent.